Enjoy the freedom of an easy and reliable wireless connection Keep your workspace clean and clutter-free with reliable, plug & play wireless connectivity. Effortlessly connect your keyboard and mouse via 2.4GHz RF wireless with a nano dongle which easily connects to a USB port, for reliable daily performance. Designed to enhance daily productivity Be productive with the Dell Wireless Keyboard and Mouse - KM117. Type comfortably on the full-sized keyboard with chiclet keys, which features a 3-section layout plus multimedia and hotkeys. Easily navigate your daily tasks with the optical mouse, designed for productivity and comfort. Compact, sleek design for a contemporary workspace Featuring a compact, sleek design, the Wireless Keyboard and Mouse are easily integrated into everyday desktop setups. Long, efficient battery life. With 12 months of battery life for the keyboard and mouse, you no longer need to stress about running out of power while going about your daily activities. The Wireless Keyboard and Mouse both have low battery life indicators that alert you to when you have low battery power remaining. Attractive design: Give your workspace a modern appearance with a stylish wireless keyboard and mouse. Great for Windows: The KM117 is compatible with Windows® 7/8/8.1/10. Easily navigate Windows 8/10 tiles with a mouse wheel that can scroll up, down, left or right. Comfort and precision: The full-size keyboard with responsive chiclet keys makes typing comfortable, while multimedia shortcut keys provide quick access to audio and video functions. Enjoy the freedom of an easy and reliable wireless connection Keep your workspace clean and clutter-free with reliable, plug & play wireless connectivity. Effortlessly connect your keyboard and mouse via 2.4GHz RF wireless with a nano dongle which easily connects to a USB port, for reliable daily performance. Designed to enhance daily productivity Be productive with the Dell Wireless Keyboard and Mouse - KM117. Type comfortably on the full-sized keyboard with chiclet keys, which features a 3-section layout plus multimedia and hotkeys. Easily navigate your daily tasks with the optical mouse, designed for productivity and comfort. Compact, sleek design for a contemporary workspace Featuring a compact, sleek design, the Wireless Keyboard and Mouse are easily integrated into everyday desktop setups. Long, efficient battery life. With 12 months of battery life for the keyboard and mouse, you no longer need to stress about running out of power while going about your daily activities. 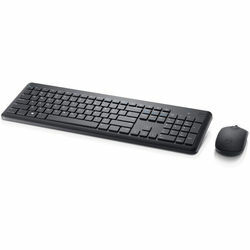 The Wireless Keyboard and Mouse both have low battery life indicators that alert you to when you have low battery power remaining.FeaturesAttractive design: Give your workspace a modern appearance with a stylish wireless keyboard and mouse.Great for Windows: The KM117 is compatible with Windows® 7/8/8.1/10. Easily navigate Windows 8/10 tiles with a mouse wheel that can scroll up, down, left or right.Comfort and precision: The full-size keyboard with responsive chiclet keys makes typing comfortable, while multimedia shortcut keys provide quick access to audio and video functions.